My purpose here was to create a simple, heavily stylized illustration in the realm of Slavic mythology--as if for a children's book--using natural materials, in this case, wood, golden buttons (tansy), and tea leaves. This illustration features, you guessed it!, two of my favorite characters as part of a recurrent motif. 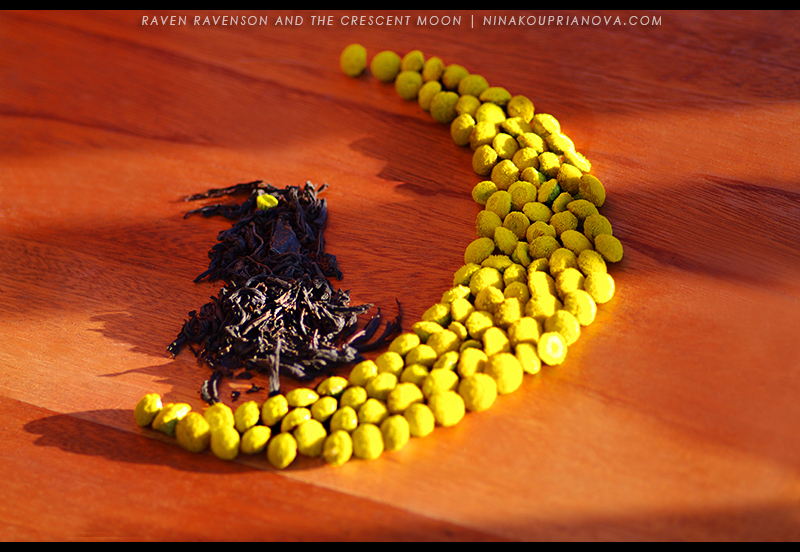 Raven Ravenson and the Crescent Moon--they meet again! Simargl, having lost his first-born, died of grief, his heart aching like that of a wounded bird. And he turned into a black Raven Ravenson known as the Iron Beak. And he took off and landed atop the Crescent Moon made of copper. And he began to oversee human affairs, becoming a god. Whenever I create images out of natural materials, photography is as important as the original. You can see the difference between the pictures above and below: the latter was shot outside, with sunbeams lighting the tansy Moon as if it were its real equivalent up above.